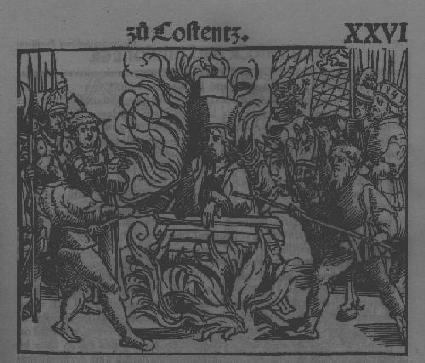 The burning of John Hus at the Council of Constance. From Ulrich Richenthal's Das Concilium: SO zu Constantz gehalten ist worden, des jars MCCCCXIII (Augsburg, 1536), a "modernization" of the original edition of 1483. Jan Hus Written by Chris Berrish, this article gives a thorough overview of John Hus and his life and influence on others. This document comes from http://gray.music.rhodes.edu/musichtmls120/hus.html. The Moravian Church: John Hus (Jan Hus) This is an article on John Hus at the Council of Constance. It explores Hus and his beliefs. it originally comes from http://www.moravian.org/hus,htm. This is a site maintained by the Moravian Church. Hussites This is from the Catholic Supersite, New Advent. It provides a conprehensive overview of the Hussites. Jan Hus This is from the Catholic Supersite, New Advent. It discusses Jan (John) Hus, his life, and his leadership of the Hussites. The Waldensian Movement From Waldo to the Reformation VI This article discusses the Waldensian involvement with the Hussites. It was written by Dennis McCallum. Peters, Edward, ed. Heresy and Authority in Medieval Europe. Philadelphia: University of Pennsylvania Press, 1980. --This is a good source for information on the trial of John Hus. For more books on Beguines and heretics in general, please see the Heresy Main Page.